Compact OEM Board for sACN/E1.31 and Art-Net to DMX512 conversion. 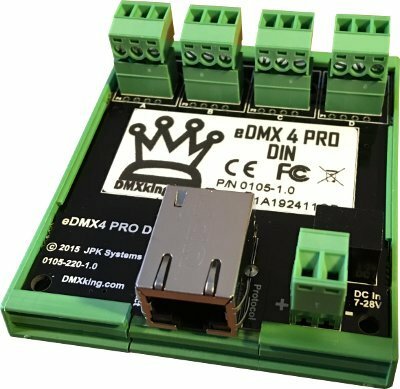 Supporting both DMX512 output and input individually configurable on each channel along with Art-Net and sACN protocols the eDMX4 DIN is well suited to distributed permanent installations tucked away in small enclosures. Designed and manufactured in New Zealand to the highest standards. Includes DIN rail mount and wall mount ($10 value). 4x DMX512 Out or DMX512 In with E1.20 RDM support. Merge 2 incoming Art-Net streams per output channel with both HTP and LTP options.